For my blog swap partner I was assigned Lulu in Los Angeles. She has a really fun blog and way more decorating sense than I could ever have. For real. I've had a lot of fun getting to know her through her blog and email. a very cute card with a bonus cookie recipe on it. knee high pink and gray socks. If you want to participate in a blog swap, you should be following Our Dandelion Wishes, because she hosts them frequently and they always have some fun theme. Your house will now have a little pink! Love the items she selected. The loaf pan would be great to make mini meatloaves. That all looks so fun! Oh! I love it!!! I'm jealous. I totally could have used this kind of swap this month. Now I kind of want to host my own. I have to come up with an idea that doesn't just include books. I think we need treats as moms, too! You just wrote you had no pink there - now you do and it is all so pretty - nice gift. You got a very nice package. I am impressed with the wrapping. Looks adorable! What a great package to receive! Very pretty wrapping and wonderful gifts! I'm so happy you liked everything. The piggy timer was my fave too! And there was only one at the store ... I'm on the lookout for another, haha! I'm so happy we were paired up to swap, I've had a great time getting to know you and look forward to following along with your blog for a long time. looks like fun!!!! always fun to open surprises. I love that you got to enjoy some pink goodness (especially in your world of blue over there). LOVE that pink piggy timer too, how cute is that! Hey there! I'm a Mamarazzi follower and I came over from your link there. That pig timer is awesome! So cute! Such cute stuff!!! I LOVE your pink and grey knee high socks! What an awesome package! That little bread pan is adorable. Cute cute cute! I want a piggy timer! How cute is that?! 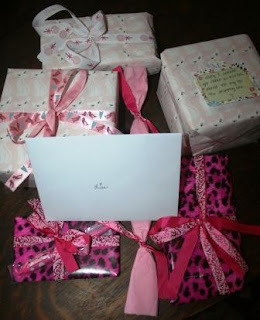 looks like a great package...loving all the PINK!! Lulu did a fab job, i just knew y'all would hit it off!! 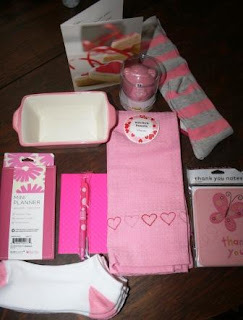 Yay for new bloggy friends AND all things pink! Nice! Love the pink and gray socks! You got some great goodies!! And you're right...she did an awesome job on the wrapping. What a great package i love the socks and the piggy timer is super cute! Very nice stuff. The loaf pan is so cute! What cute stuff! Doesn't Mamarazzi just ROCK! I want those dish towels - so cute! I really like those socks. What a fun package! cuteness! love the lil pan:) this was a FUN swap!